For all of you out there watching the clock tick as you await the weekend—wrenching time, as I call it—I’ve got something to hold you over for a few hours: I’ll be swapping a shock absorber today live on Facebook, and could use your help. Can you hand me that 9/16th combination wrench, please? I’ve also noticed increased brake dive, which has caused my rear tires to lose traction on multiple occasions under braking (it doesn’t help that the tires are nearly bald). More recently, the XJ has developed this strange noise when I hit bumps that sounds like that squeaky penguin from Toy Story. Anyway, all of this funny business ends today. 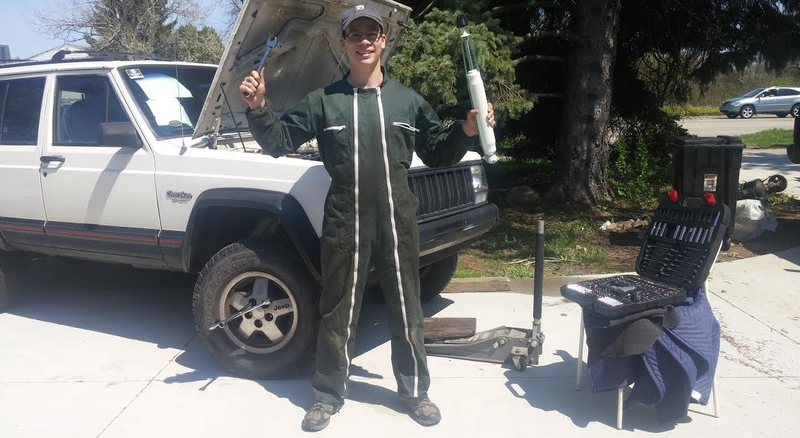 I’ve got a new shock, a dorky green onesie, and a sunny afternoon prime for some peak afternoon wrenching.